A dog is coming at you full force off leash ready to attack. What do you do? Cry? Pee your pants a little? Run away? Maybe all of the above? The most important thing to remember is this: Stay calm. 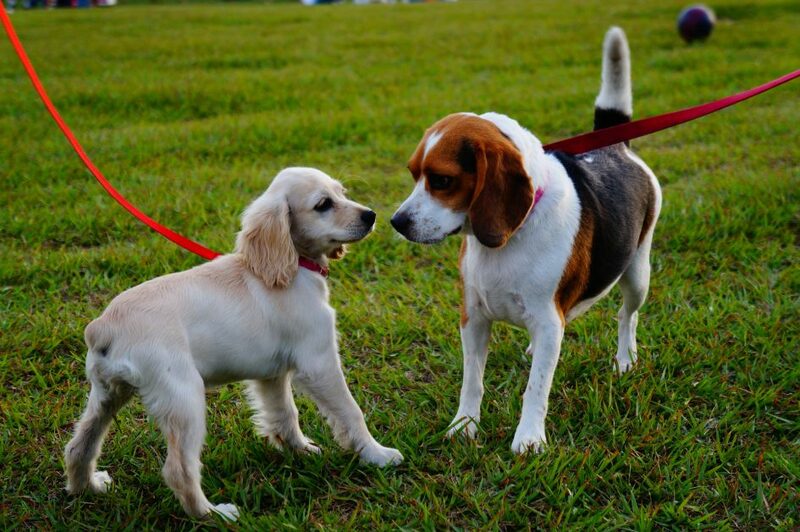 Do you know what to do to prevent a confrontation and keep your dog (and yourself) safe? I have had plenty of off leashed dog encounters over the years and some I have handled gracefully and others not so much. Lucky for you I have found the best approach with 3 simple and easy to remember steps to take when an off leash dog is approaching. I let the dog I am walking know I got this by stepping in front of them and making myself “big”. Chest out, arms wide, knees shoulder width a part and standing tall. Mind you I am only 5ft. This allows the dog you are with to remain calm and not feel pressure to “protect” you. Then I put my hand out and give a firm “NO!”. Most of the time dogs will stop and go in another direction because they are caught off guard. Another thing you can do is if the dog stops even for a moment, distract them by tossing a handful of treats on the ground. Then make your escape with your dog while the other dog is focused on the treats. If a firm, “NO!” does not work then I recommend moving on to deterrent #2. 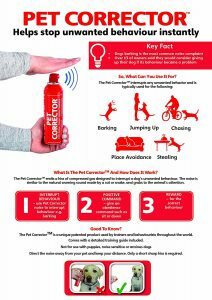 The Pet Corrector is a can of compressed gas that makes a startling noise when released. Dogs hate the high-pitched hissing sound when they hear it.The Pet Corrector was invented to “do no harm” but also to be used as an aversion when the dog was doing a bad behavior or in this case startle the dog getting ready to attack. This easily fits in any pocket or the awesome pack I mentioned in the basics. The idea of the Pet Corrector is to distract the approaching dog and I have yet to see one dog continue to come at me after releasing this god awful gas sound. It can be startling but it usually gives me enough time to get myself and the dog I am walking away from the situation without doing any harm. However, if this does not work then I recommend moving onto deterrent #3. If the pet corrector is not stopping the dog from approaching then I resort to using a safe, yet effective, all-natural dog spray. This helps prevent injuries to you, your dog, and the attacking dog. This little thing shoots up to 15ft which allows you to hopefully prevent contact. I’ve only had to use this once; a doberman came barreling out of its house down the road, teeth showing (I had a clients dog) I stepped in front of the dog I was walking and at about 5ft did a quick burst of this and the dog immediately started rolling around in the grass rubbing its eyes and finally the owner came running and grabbed the dog. I followed up with the dobermans owner after dropping off the dog and she said she gave him a quick water flush and he was okay. Luckily, she apologized and was not too angry about me spraying her dog. (ps-I may or may not have peed my pants a little during all this). There are a variety of products out there to deter animal/ human attacks. The two products I will forever rely on is the Sabre spray and Pet Corrector. They are cheap, discreet, and easy to carry. Neither will cause long-term damage to the other dog or person and using it doesn’t require you to make physical contact with a dog that may be approaching. It’s the perfect tool to carry every day during your walks. Most of us make two mistakes when it comes to walking pups in the dark. First, we put our lights and reflective stripes on the wrong parts of our bodies to grab a driver’s already splintered attention. Second, we overestimate how easy it is for drivers to spot us, while drivers are similarly overconfident that they will spot people moving alongside them in the dark. Day or night, visibility is all about contrast — how much something stands out against the background. Most night walks or bedtime visits I put this extremely attractive (insert excessive sarcasm) 247 VIZ reflector vest on and if it’s a long walk I will put the bands around my wrists. You can never be too careful especially with every person staring at their phones while driving! In the winter months when it gets darker earlier- I wear this nerdy beanie with a light on it. It helps when your trying to find poo in the dark!